This month’s Stuff Magazine features Last.fm in their Best of British feature. We’re alongside two of my favourite things: McLaren and Alan Partridge. I made a visualisation on UK listening trends to accompany this. 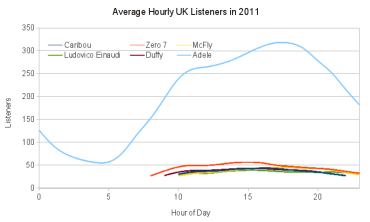 It shows off our data nicely, condensing listening statistics for 2.5 million artists across the 8,760 hours of 2011, to find the artists that best characterise UK listening for each hour of the day. You can see it below, or download the full version (pdf) for a proper look. It’s loosely based on the listening trends graphs that subscribers can access on our playground. The exact meaning of the statistical methods used to create this can be a little unclear, so I thought I’d try to explain. I’ll focus on giving a general feeling for why each artist shows up in the visualisation, rather than going into detail about the sums. The visualisation shows the top-ranked artists in the UK, for every hour of the day. So how does an artist top the ranks? Each artist is given a score—for each hour of the day—that is based on how many more listeners they have in that hour. This is compared to their usual hourly activity. What you see in the visualisation are the artists that score highest in each hour. I’ve shown some average hourly listener counts for a selection of artists that made it into the visualisation in the image below. Note that the vertical scale starts at 20; I want to highlight the differences between each artist, rather than the numbers themselves. 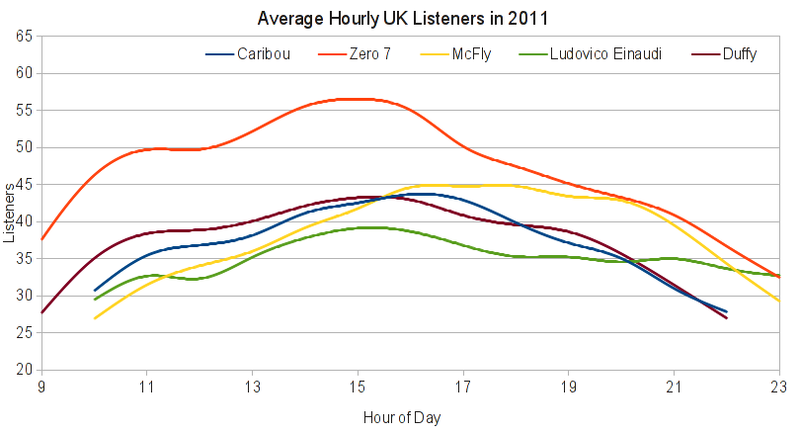 Artists like Zero 7 and Duffy come on strong in the morning, compared to Ludovico Einaudi who has a much flatter listener count throughout the day, but continues until late at night. 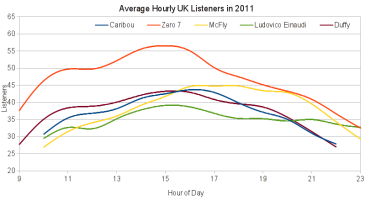 Similarly, McFly gains popularity in the late-afternoon but drops off relatively quickly as bedtime approaches. 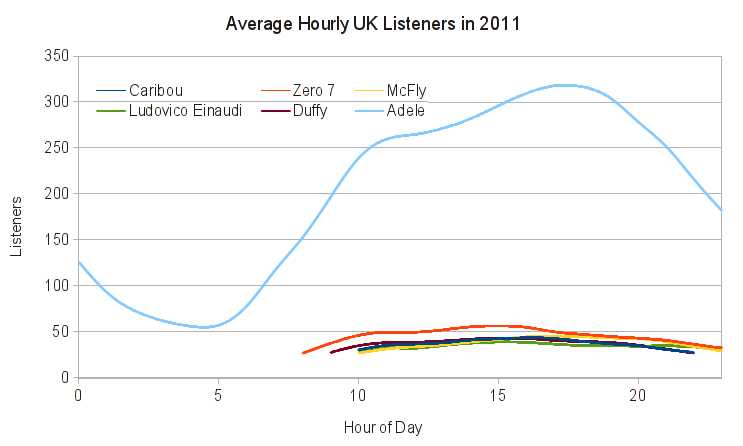 The key to these artist scores are the differences between their listener counts at various points in the day, and how they change relative to other artists. What’s going on at night? The far left and right sides of the visualisation show night time listening. The top artists here are those that usually top our charts. I’ll explain why. First, I should point out that their scores are negative. That means that they see a reduction in listeners during the night, which makes a lot of sense. The reason they are ranked top is because their score falls the least overnight. There is another aspect to the night time calculation. I filtered out hourly scores that fell below 25 listeners, as a noise reduction measure; this is because we need a reasonable amount of data to allow the statistics to work. I have taken the above graph and thrown in Adele, to further illustrate how the score works. You’ll see that her listening graph dwarfs those of the other artists in the visualisation. However, her ranking remains relatively low during the day because she has no particularly strong hourly trends that separate her from other artists. Thanks to Stuff Magazine for featuring us, and also for explaining what Last.fm is to my mum; it’s the first time she’s really understood what it is, and what I do here. How would this look like when one would split this in e.g. work days (Mo-Fr) and weekends (Sa + Su, or both separate) ? I could imagine perhaps: work days more faster rhythm tendency ? Good question. I’d be inclined to guess at the opposite actually; in the visualisation we have some pretty chilled out artists during working hours. Either way, I’ll have to find out. If I get time I’ll dig around a little further! the places you could go & theories you might come up with, if you threw in a few not too vague &/or abstract theories of probability, purely for fun – just 2C what wacky weird & wonderful(not 2 say snazzy !!!) Theories to discover ! Being real curves,calculated & precise statistics,giving plausible results !!! Who says Science is supposed to be boring ? ? ? Anyway please keep us up to date,OK ? And Well Done !!!!!!!! In Other Words: Einstein Move Over !!! “So, what effect did Adele had on that chart?” “Well, it looks like throwing in Adele.. made a big splash” YEAEEEEEH!!! 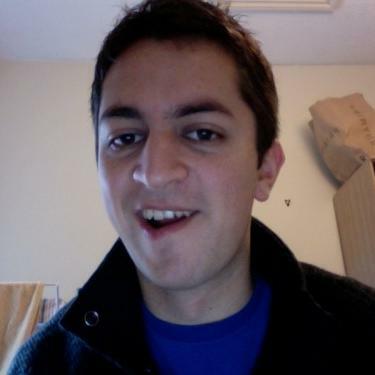 hi blog talk hakkında bilgiler vermişsin zahmet etmiş vaktini harcamışsın, sana teşekkürlerimi sunarım. şimdi işkur kursları hakıknda bilgi sahibileri olmak istiyorum, biraz açaklamalrı bulunsan talk about post gibi bir makale yazsan elerine sağlık diyeceğim.